“Rhythm is one of the most fundamental formal means of composition in classical music, poetry, and architecture,” according to architectural lore. Think of colonnades, window placement, stacked office floors, fence posts and pilons. Repetition provides a tool of spatial organization. This much is obvious. Is it repetition that animates people’s lives, or rhythm? In his book Rhythmanalysis, philosopher Henri Lefebvre says repetition is a mechanical process. As a neo-Marxist he was bound to tilt his assertion towards the political. Capitalist machinery operates repetitively, as it treats everything the same. On the other hand there’s the more organic phenomenon of rhythm, which takes account of the vagaries of context, involving variation, and even memory. Lefebvre offers the example of the rhythm of the waves on the sea, which is more than a mere repetition — as it involves counter movements and complex overlays of movement. The sea moves according to a range of contextual factors such as the shape and materials of the shore, the tides, and weather conditions — and of course the pull of the sun and moon. The body too operates rhythmically, as its movement depends on the body’s size, shape, strength, condition, and context. Rhythm is a bit like repetition, but with modification. Every stroke need not be exactly the same. Alternatively, we could think of repetition as a diminished and reduced kind of rhythm. For Lefebvre, notions of difference are more important than sameness, and rhythm foregrounds difference. 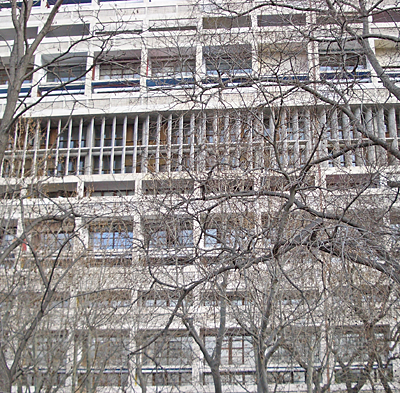 A few years ago I visited Le Corbusier’s Unité d’habitation in Marseilles. It’s a modernist prototype of industrial-scale housing, and as such falls within Lefebvre’s idea of mechanistically ordered repetition. But like all good moderns, Le Corbusier had an eye on the organic — and the “natural” order of things. 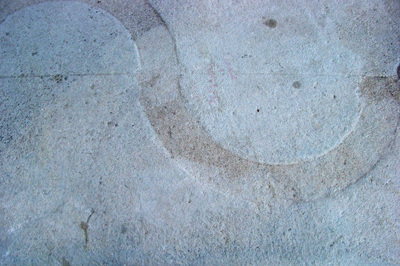 The large plinth at the entrance to the Unité has cast within it a diagram of two half circles positioned along a horizon line, one the inverted form of the other, and with two lesser semicircles at either end. As I recall the diagram is above head height and difficult to photograph. It seems that variation throughout the days and seasons is crucial for life to exist. Paleontologists say that life could not have started or developed were it not for the planetary tilts, pull of the moon, and orbits that provide daily and seasonal cycles of light, temperature, and tides. Organisms, which is to say life, seem to require variations, and periodic oscillations between stress and comfort, which create the interstitial zones where life takes root. Variation is born of rhythm, of oscillations between conditions, and the oscillations in turn are enabled by irregularities, tilts, and eccentricities. I visited Lindisfarne last weekend, the site of the first Christian community in England. You have to time your visit to match the ebb and flow of the tides, which can vary by as much as an hour and a half from one day to the next. The opening quote is from a book by Tzonis and Lefaivre (not to be confused with Henri Lefebvre). The first image is of the pedestrian causeway at Cramond Island, near Edinburgh. 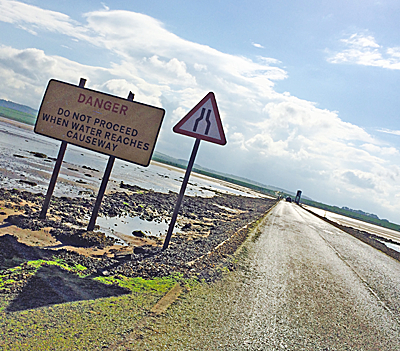 The last image is the causeway at Lindisfarne. Le Corbusier’s diurnal cycle at Marseilles is difficult to photograph as it’s on the top of the plinth above head height. I explored the theme of rhythm in Coyne, Richard. 2010. The Tuning of Place: Sociable Spaces and Pervasive Digital Media. Cambridge, MA: MIT Press. The OED provides a long entry for “tiding,” which means simply something that happens. An early meaning suggests something that happens regularly, as a custom or habit. A good or glad tiding is of course simply good news, good event, good habit. For a discussion of habits see blog post A nation addicted to smartphones. Also see Obliquitous computing. Palmer, Michaela, and Owain Jones. 2014. On breathing and geography: explorations of data sonifications of timespace processes with illustrating examples from a tidally dynamic landscape (Severn Estuary, UK). Environment and Planning A, (46) 222-240. Richard, this is such an important distinction between repetition and rhythm. Even though I teach music technology and use computers in composing, I dislike perfectly repetitious beats in dance music. Interestingly, there are many ways to “push pull” the beats for a more organic feel, a technique often called “humanizing” the beat. When teaching sound synthesis and electronic orchestration, the discussion regarding the perfectly “in time” and perfectly “in tune” qualities of synthetic music becomes rather lively. “Rhythmanalysis” might be an interesting addition to that conversation.